UPDATE: the elections will be held on November 25th. The Catalan newspaper Ara is reporting that Artur Mas is about to call early elections, likely to occur on November 18 or 25 or December 2. Spanish PM Mariano Rajoy stated in parliament today that he doesn’t agree with the Catalan view that a new fiscal pact ought to be agreed. This was supposed to have been the subject of discussion in a meeting between Rajoy and Mas tomorrow morning in Madrid. It is believed that Mas could call the elections tomorrow, immediately after this meeting. There is widespread expectation that these elections could take on the form of a referendum on Catalan independence from Spain. For this to happen, the governing CiU will have to form a national bloc with parties sympathetic to independence: ERC, ICV and SI. The Catalan federations of the two main Spanish parties, PP and PSOE will oppose independence, with support from Ciudadanos. The groups in favour of independence appear to see that speed is of the essence now. They aim to benefit from the upswing in support for separatism seen at last week’s demonstration in Barcelona. They probably also fear the Spanish government invoking section 155 of the Spanish constitution, which allows for central government to establish direct rule over autonomous communities seen to be in breach of the constitution. Does this render independence any more likely? It’s hard to say. There can be no doubt that more people here are taking the question seriously. But CiU will have to negotiate a pact with leftwing ERC and ICV to have a chance of an absolute majority. But I get the feeling that there are plenty of Catalans who might balk at the last minute, either due to the uncertainty that independence might bring or because of their dislike for voting for any CiU-led coalition. Because of the speed with which the independence movement has gathered pace and the possible sanctioning of Catalonia’s self-government by Madrid, these elections will likely prove to be the supreme test that separatism must pass if it is going to succeed. If not precisely inevitable, Catalan independence now seems much more likely than it did a couple of years back when I first framed my questions for supporters and opponents of Catalan separatism. Many of those questions remain valid. But my main focus has shifted. This reduced list should read as a demand from those leading and supporting the independence movement that they for once and for all clarify various matters that I believe worry many people currently. Because if Catalonia really will be the ‘Next State in Europe’, these matters need to be clarified now, not later. 1 – What social model will an independent Catalonia have? While the right are currently in power, and have governed for the majority of Catalonia’s post-Franco years, there is a significant section of Catalan society that supports parties of the left. We’re deeply unhappy about the cuts that Artur Mas has made to public health, education, social assistance and public sector pay during the financial crisis. Mas has blamed these cuts on Spain’s mishandling of the national economy. Very well: if that is true, he must now guarantee to restore, improve and protect public sending and investment in the event of independence. 2 – Will you now, and forever, forgo all claims on the territories in Spain and France sometimes referred to as the Catalan Countries? I shouldn’t need to explain the importance of this question. The only chance of success as a state depends on France’s and Spain’s recognition. That won’t happen unless you formally reject territorial claims on Rosselló, Valencia, the Franja and the Balearics. 3 – What status for non-Spanish residents in Catalonia? OK, this is a personal one, but it affects lots of people and many businesses. Will you now guarantee our status as permanent residents? What chances for citizenship will we have? 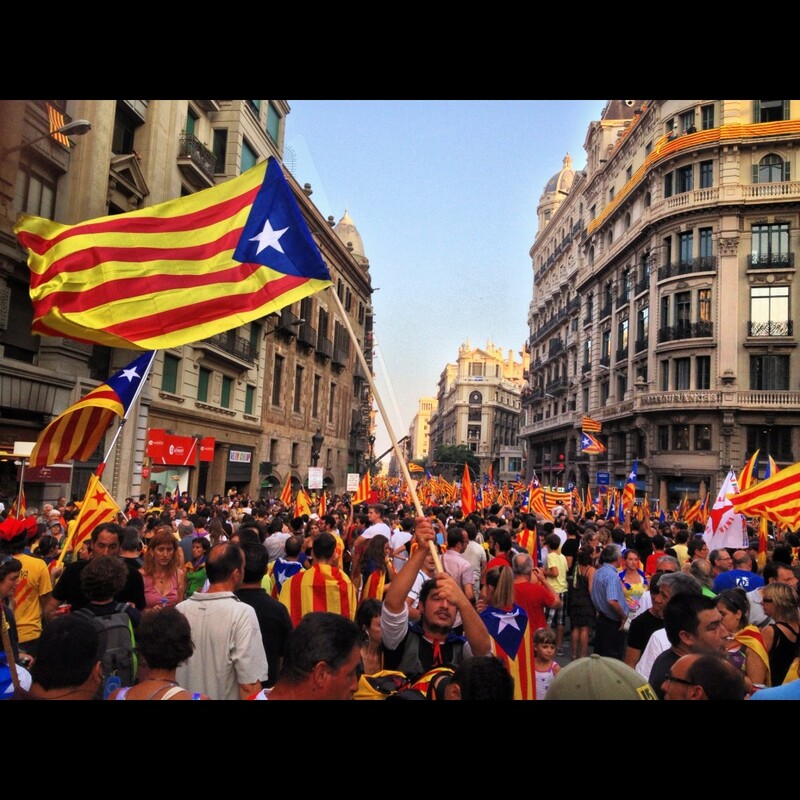 thebadPoll: Is Catalan independence now inevitable? So now that the estelades have stopped waving in Diagonal and Via Laeitana, what will be the overall result of this march? Is Catalonia really a big step closer to independence now? Or is this a flash in the pan that’ll recede when the economy picks up? Do you feel that a change has happened here? Or do you reckon it’s just more of the same? Cast your vote below or in the sidebar on the right. And as always, leave a comment below and explain your vote. This blog has seen plenty of debate concerning the whole independence issue. In May, I wrote that I wasn’t sure that Catalan independence had majority support. I now believe that it does. We went to Barcelona today. It took an hour to get to Via Laetana from Gràcia FGC station. The police say 1.5 million people turned out; more than the organisers expected. The PSC didn’t support it. Convergència was taken by surprise. Unió was utterly shocked. All the parties have been sidelined by a popular movement that can’t be ignored. Today’s demonstration was a step towards Catalan independence. The largest demonstration Barcelona and Catalonia has ever seen, and unequivocally in support of independence. I find it difficult to believe that Rajoy will offer us a ‘pacte fiscal’ that does the job. When he fails to do so, I expect early elections here and a national platform in support of a referendum. Next Tuesday, Catalonia’s national day, will see thousands of people demonstrating in Barcelona, in support of Catalan independence. I will attend and support the demo on the basis of my support for the right of people to decide: the right to self-determination, especially after a retired Spanish army officer threatened us with violence last week; and support for the Catalan language, under attack in multiple Spanish regions governed by the PP. Not all of Catalonia’s problems would be solved by independence. Indeed, independence would probably bring about the existence of new problems we’ve not even considered yet. But that doesn’t mean it’s definitely not worth looking into. A fair distribution of the revenue generated by Catalonia seems impossible to achieve. Would we have better social cohesion and healthcare and so on if we had all the money raised here? Would my EHIC application be approved a lot faster, allowing me to get health insurance before it’s too late? It’s not a certainty but we’d be in a much better place to argue for it. To defend the right to self-determination in the face of threats from past-it Spanish colonels strikes me as a perfectly reasonable thing to do on a Tuesday afternoon. 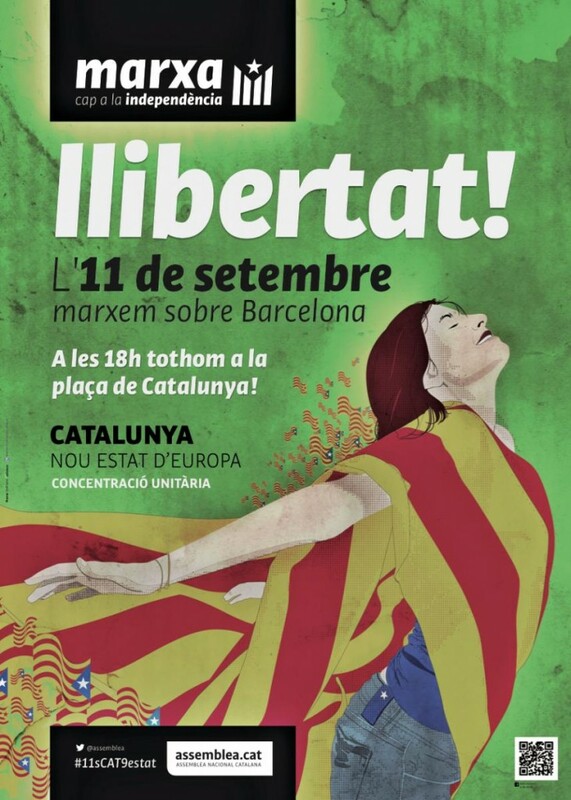 See you in Plaça Catalunya at 18h.